When she was in town a few weeks ago, I finally got around to working on her necklace request… ahhh…. a year later. We went upstairs and I started going through my bead stash. Oh so many beads, oh so many ideas, but I knew what I was looking for and I hoped it would appeal to her. I went for the bone, nuts, horn, stone, porcelain and carved things that I had. Each drawer I pulled out made me smile and also gave me a feeling of the past. I have tons of beads left over from a past life as a full-time beader. I felt such a strong connection with these beads as I started going through them and pulling out things I thought would work. Mom was right there peaking in my drawers with me. It was nice to have her here with me to look at the beads and talk about the colors she wanted. We worked on the layout of the bead together, after all, I wanted her to be happy with the finished necklaces. Before she headed back to Florida I finished two necklaces and she was very pleased with them. What are all the materials? Start at the end of the necklace that has the round end of the toggle clasp (upper left corner). I had a lot of fun digging through my drawers of beads. It really tugs at me to work with them. I’ll show you necklace #2 next week. Have you been in a creative mood? What have you made? 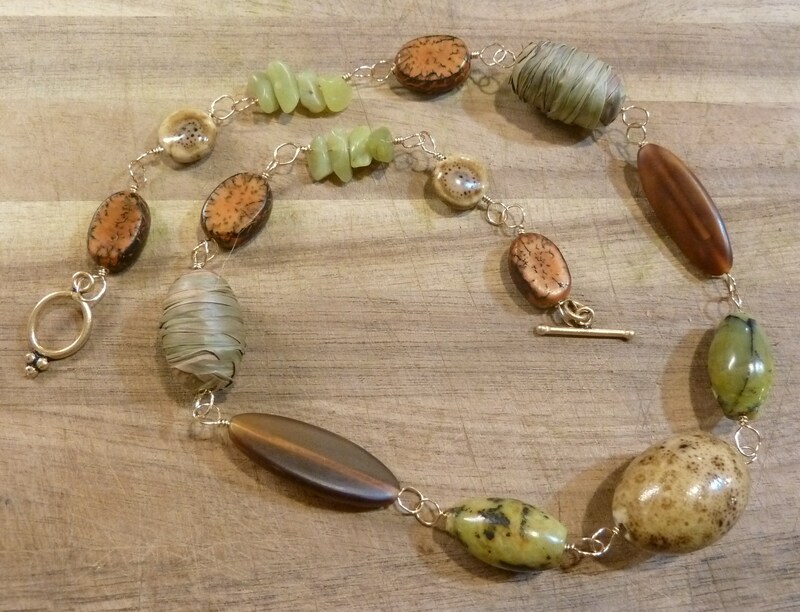 This entry was posted in Beading, It's About Time and tagged beading, beads, Chinese turquoise, handmade gifts, horn beads, necklace, palm nut, porcelain, raffia, wirework. Bookmark the permalink. So pretty! Looking forward #2! Currently I think I’m on burnout…… Can’t wait for Spring to arrive! I was just looking at your glaze tests. Oh the mugs are beautiful, but I understand what it is like to just want spring to hurry up and arrive. I felt that many-a-years living in MN and WI. Now that I live in S. TX I look forward to spring, but not summer. Completely reversed! Thanks Nancy, she really liked the necklace. I am so happy to be able to make her something that I know she will wear and enjoy!